The studies show that as well. 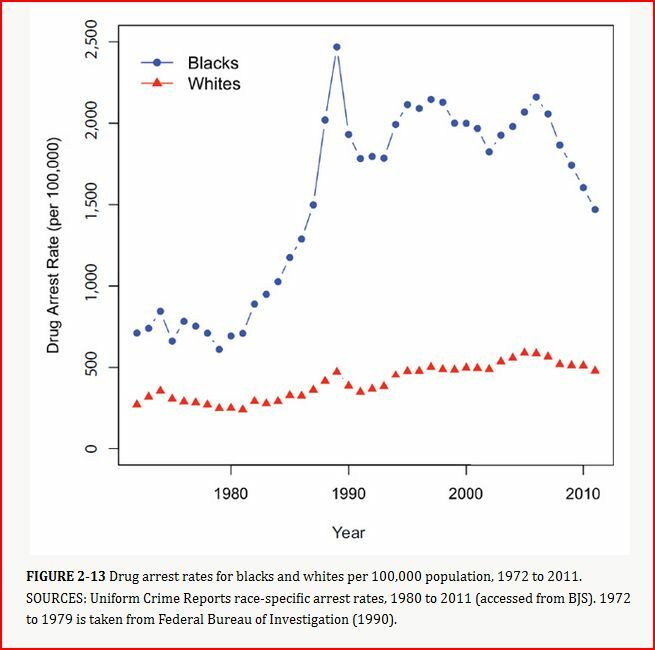 Blacks and whites use drugs at the same rate but black people get arrested way more often for it. Is it true that the proportions of black and white drug users are (approximately) the same in the USA, but the arrest rates there are (significantly or disproportionately) higher for black drug users than white drug users? A similar claim is often made, but limited to the use of marijuana. For that, the Washington Post has a good overview. The results for overall drug use are similar to those results. The dataset that is used most often to evaluate claims like this is the National Survey on Drug Use and Health. You can view the data here for 2011. You can view a table showing data from 2012 here. 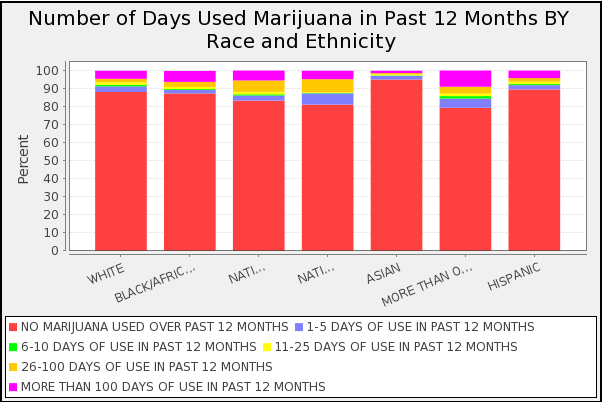 Basically, while white people tend to try drugs in higher numbers, looking at the "past month" value, it can be seen that black people do drugs in slightly higher numbers. Since some are cropped, the data labels are: (1) White, (2) Black/African American, (3) Native American/Alaskan Native, (4) Native Hawaiian/Other Pacific Islander, (5) Asian, (6) More than one race, (7) Hispanic. [T]he National Research Council report says, "In recent years, drug-related arrest rates for blacks have been three to four times higher than those for whites. In the late 1980s, the rates were six times higher for blacks than for whites." In every year from 1980 to 2007, blacks were arrested nationwide on drug charges at rates relative to population that were 2.8 to 5.5 times higher than white arrest rates. The above data shows that while black people do marginally more drugs, they are arrested disproportionately more often than white people. 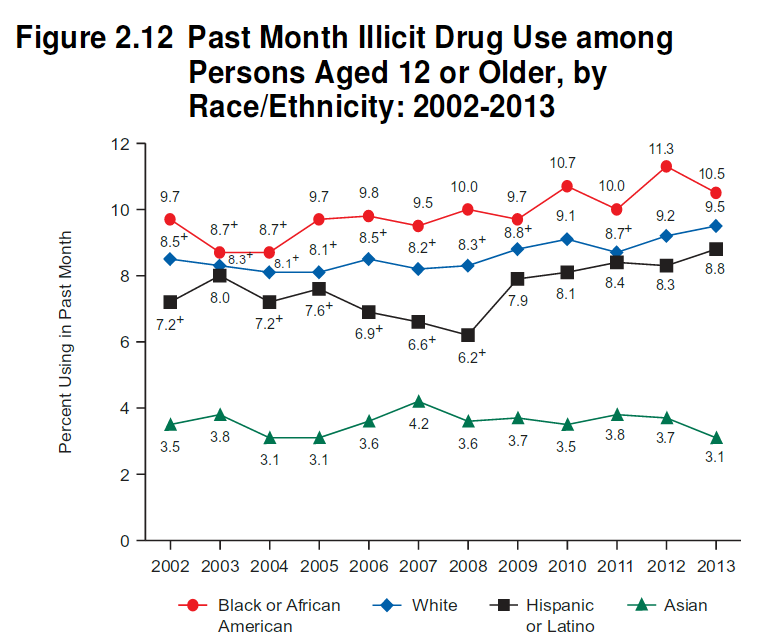 [...] African-Americans don't use drugs at a higher level than whites but wind up going to prison six times more. [...] We rate his claim Mostly True. Not the answer you're looking for? Browse other questions tagged united-states recreational-drugs racism .